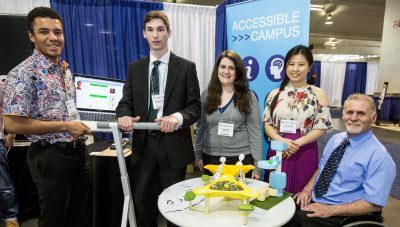 READ Director Dean Mellway (left) with Carleton undergraduate student finalists, (left to right, Quayce Thomas, Brendan O’Brien, Dayna Conway and Jin Kyung Kim) and their projects at the 2015 IDEA finale, May 29, 2015, at the People in Motion Exhibition. Three Carleton projects made the top ten in the Province and the team of Quayce Thomas and Brendan O’Brien won both first place for the Timsle Project and second place for the Ascent Line. All of the submission from Carleton students are presented below.